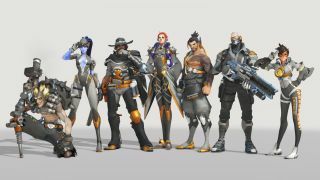 As stage two of the Overwatch League kicks off, a new system of rewards has been introduced for viewers of matches, who will be able to earn tokens for every game they watch – and these can be used to purchase in-game team skins. To collect these League Tokens, spectators must first link their Battle.net account with their Twitch, MLG.com, or Overwatchleague.com account. At the conclusion of every bout on a map watched live, the viewer will then get one token. There’s an added bonus at the end of every full match, when a small number of randomly selected spectators will hit the jackpot with a reward of 100 tokens. For 100 League Tokens, you can buy the in-game skin of your favorite team. There are a couple of points to note here – tokens will expire at the end of the year if not cashed in, and the scheme is currently limited to the UK and US, plus Argentina, Canada, Chile, Denmark, France, Germany, New Zealand, Norway, Saudi Arabia, South Korea, Spain, Sweden, Switzerland and Taiwan. Hopefully the number of regions covered will expand in time. Another interesting development is the introduction of the ability to use ‘Cheering with Bits’ on Twitch to unlock rewards (on an individual, and also team-based and ‘global’ basis, when certain overall ‘cheering milestones’ are reached). Possible rewards include special hero and team emotes, plus Overwatch League skins. Special hero skins will be unlocked when ‘global’ cheering thresholds are reached (the combined cheering might of all spectators). Check here for more info. All of this is evidently part of the push to get more people watching matches live, although there's already a good number of spectators. As we saw last month, over 10 million fans watched matches during the first week of the Overwatch League. Currently, New York Excelsior is the team at the top of the league, having only suffered one defeat with a 9-1 record. At the other end of the table, Shanghai Dragons continued its unfortunate 11-game losing streak earlier today – the team has still yet to win a match, which must be pretty hard on morale.